EZ-Chew® Omega 3 Max Strength Soft Chews for Small/Medium Dogs from Stratford Pharmaceuticals provide a rich source of Omega 3 fatty acids to your pets. Designed for small and medium sized dogs and cats‚ this health supplement is a great way to keep your pet healthy. The two major Omega 3 fatty acids are known as EPA (Eicosapentaenoic Acid) and DHA (Docosahexaenoic Acid). Researchers believe that they can reduce the symptoms of inflammation in the joints and bones while curbing stiffness and pain. Omega 3 fatty acids may even help in supporting your pet’s immune health. Since Omega 3 fatty acids are so essential and may not be produced by the body‚ it is vital to supplement them in the diet. This supplement from Stratford Pharmaceuticals may go a long way in keeping your pet healthy and happy. Use EZ-Chew® Omega 3 Max Strength Soft Chews for Small/Medium Dogs and Cats from Stratford Pharmaceuticals for good health. Inactive Ingredients: Glycerine‚ molasses‚ vegetable starch‚ sucrose‚ pork liver powder‚ macrogol‚ vegetable fiber‚ dicalcium phosphate‚ vegetable shortening‚ magnesium stearate‚ silica‚ iron oxide‚ Vitamin E and rosemary preservative. Store tightly closed at room temperature to ensure freshness. Safe for use in pregnant animals or animals intended for breeding has not been proven. If animal's condition worsens or does not improve‚ stop product administration and consult your veterinarian. My Vet recommended EZ-Chew Omega 3 Max Strength Soft Chews for Small/Medium Dogs and Cats (Low Allergen) by Stratford Pharmaceuticals to help my poodle's hay fever. She takes one a day and loves them. They do appear to help allergic symptoms and, as I said, she loves the "treat". 1)Dog loves them. 2) seem to help allergies. 3) much cheaper then thru the Vet's office. 4) I like the fact that it is rich in Omega-3 Fatty Acid. Fishy smell , but not too bad. 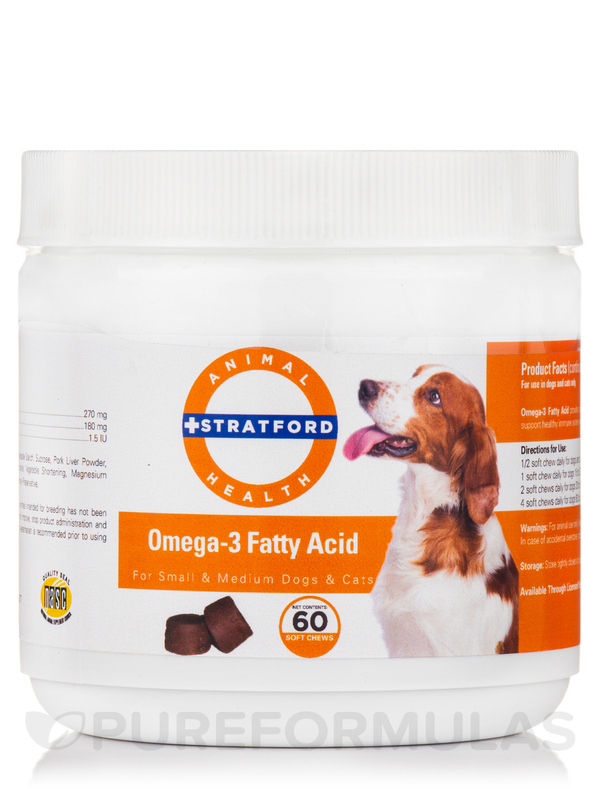 EZ-Chew Omega 3 by Stratford Pharmaceuticals is chewable and have not problem getting dog to eat.